An artists reception will take place in the Canyon Gallery on Friday, January 22, from 5-7 p.m. 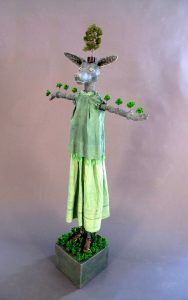 Trees have played an important role in many of the world’s mythologies and religions, and have been given deep and sacred meanings throughout the ages. Human beings, observing the growth and death of trees, the elasticity of their branches, the annual decay and revival of their foliage, see them as powerful symbols of growth, decay and resurrection. For this exhibition, artists working in various media install lightweight tree canopies from the ceiling of the gallery. Additionally, the three main walls of the gallery will be covered with treeforms completing an artistic forest. 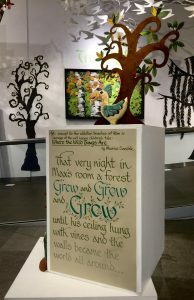 In this fabricated landscape, two and three dimensional artworks by local fine artists are installed celebrating the beauty of living trees and promote awareness of how they benefit all creatures, providing shelter, shade, nourishment, oxygen…life itself. Participating artists include Cha Cha (curator), Gretchen Acharya, Susan Albers, Martine Amade, Sarah Amorese, James Balog, Elizabeth Black, Joy Boston, Chris Brown, Pat Chapman, Pinque Clark, Amy Guion Clay, Catherine Cleary, Annette Coleman, Carolyn Crawford, Erinn Diekman, Karen Dombrowski-Sobel, Caroline Douglas, Buff Elting, Willi Eggerman, David Foley, Carol Garnand, Susan Garson, Robin Grabowski, Emma Hardy, John King, Sally King, Kevan Krasnoff, Calista Morrill, Pamela Olson, Tom Pakele, Astrid Paustian, George Peters, Frank Sampson, Mary Lynn Schumacher, Anne Shutan, Arabella Tattershall, Melanie Walker, Carol Watkins, John Waugh, Jane Yamada, and the Boulder High art students of Virginia Schick and Kate Villareal. Saturday, Jan. 23 at 1-3 p.m.
Ages 6-9. Drop-in, no registration required. Wednesday, Feb. 3 at 4 p.m.
Thursday, Feb. 4 at 4 p.m.
Young Scientists: Explore the Trees! Sunday, Mar. 13 at 1 p.m. Registration required (opens February 28) for Grades 1-5. Play-Well Trees Come to Life with LEGO! Tuesday, Mar. 29 at 6 p.m.
Join a group of local dancers and singers as they explore the “Tree of Life” exhibit in the gallery. Afterwards, Sans Souci Festival of Dance Cinema reprises videos from previous festivals. Thursday, Jan. 28 at 10:15 a.m.
Monday, Feb. 29 at 10:15 a.m.
Tuesday, Mar. 29 at 10:15 a.m.
Saturday, Apr. 2 at 10:15 a.m.
Events are generously sponsored by the Boulder Library Foundation in celebration of the Tree of Life Events.